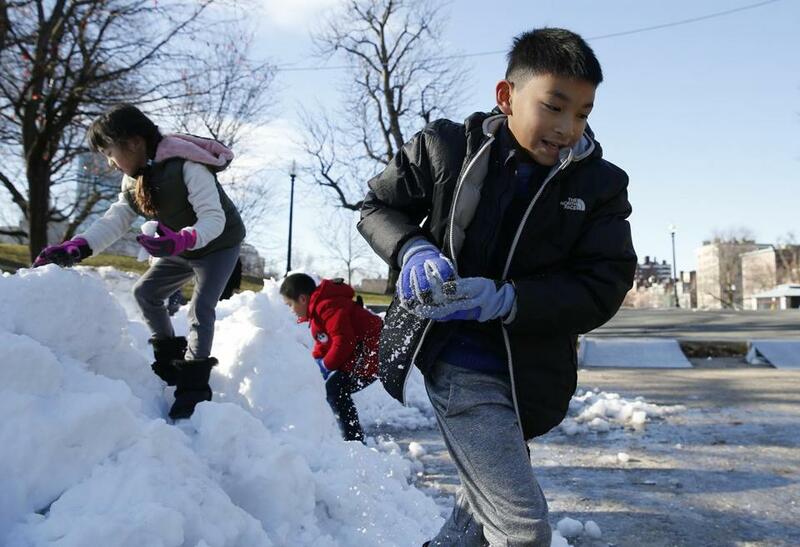 A boy played with other children on a pile of snow left by the Zamboni near Frog Pond on Dec. 30. Boston could see a half-foot of snow this weekend in what is expected to be the season’s first significant snowstorm. While forecasters reduced their anticipated snowfall totals Thursday afternoon, the city could still see 6 inches of accumulation. Communities to the north, like Lawrence and Newburyport, could see up to a foot, according to the National Weather Service. The service has issued a winter storm watch for all of Massachusetts from Saturday afternoon through Sunday evening. But as with any weather forecast, there could be some surprises. Yes, there’s a snowstorm coming Saturday into Sunday. 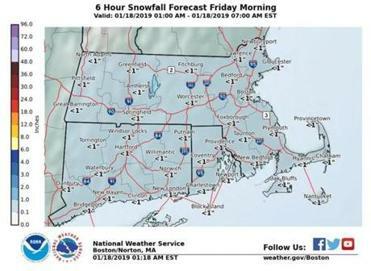 But light snow is also expected early Friday in Massachusetts, so commuters beware. The weather service cautions that the anticipated quantities for the weekend’s “mix of wintry weather” could change as the storm makes its way east. It is difficult to predict in part because it isn’t expected to travel a path southeast of Nantucket, like a classic nor’easter, but instead should stick closer to the mainland, Buttrick said. “It is very tricky when it travels right over southern New England like that,” she said. The storm will cross the country over the next two days as it heads toward the region, she said. As it gets closer, and more data are available, forecasters will have “greater confidence as to the placement of the snow, the placement of the rain, the rain-snow line,” Buttrick said. “We’re still a long way away,” said another National Weather Service meteorologist, Bill Simpson, Thursday afternoon. In the service’s latest snowfall map posted online Thursday afternoon, Foxborough is expected to see 6 inches of snow, and Taunton, Plymouth, and New Bedford 4 inches. Cape Cod and the Islands are expected to see between 1 and 4 inches of snow, according to the weather service. Pockets of Central and Western Massachusetts, meanwhile, could get hammered by the storm. Fitchburg could see 14 inches of snow, Greenfield 16 inches, and Amherst a foot. Springfield is could see a blanket of 7 inches of snow, while Worcester is expected to get 8 inches. There is also a potential for ice accumulation, which could damage power lines, trees, and affect travel. Precipitation in Boston is expected to begin around sunset Saturday. Strong winds might lead to power outages, and heavy rain could cause minor flooding in some areas, particularly along the coast during Sunday morning high tide, officials said. The weather service said it has high confidence in the storm’s effect on the region, but low to moderate confidence in what kind of precipitation will actually fall. The amount of snow, sleet, and freezing rain the storm will bring will develop over the next few days, forecasters said. On Thursday, temperatures will reach the upper 20s, and the region will remain dry until Thursday night, according to the weather service. Light snow is expected early Friday, so commuters beware. “Though light, it will have bad timing, coming ahead of and during the Friday morning commute,” forecasters said. Accumulation is only expected to reach about a half-inch across Eastern Massachusetts and Rhode Island. Precipitation is expected to change over to rain later in the morning. “Take it slow on the roads Friday morning as untreated surfaces will become slick and hazardous,” forecasters said. Temperatures will reach the upper 30s and low 40s in coastal areas of Massachusetts on Friday. The coming storms may soon be followed by another, the weather service warned. Abbi Matheson can be reached at abbi.matheson@globe.com. Follow her on Twitter at @AbbiMatheson. Jeremy C. Fox can be reached at jeremy.fox@globe.com.